My favorite spot in California is Big Sur and I drive up once or twice a year. I was so fortunate with the weather this year – it was warm and sunny and the drive was lovely, especially listening to one of Alexander McCall Smith’s books on tape along the way. First stop were the premium outlets in Camarillo (www.premiumoutlets.com) where you can always find something you like. It is the Carmen exit off the freeway to the left and over the freeway. There must be at least 50 stores to choose from. wandered around the little town, picking up a little something to eat at the red house cafe (www.redhousecafe.com) nearby. In the morning I sat by the window and had a peacful breakfast overlooking the ocean. Since there are bikes available at the inn I chose one and rode along the water to the lighthouse and back. It was a gorgeous day!!! After a leisurely stroll down lighthouse avenue and a look into some of the cute little shops, I drove into Carmel. Visiting the art galleries and unique stores off Ocean Avenue is always a treat. If you arrive at Sierra Mar (the restaurant at Post Ranch Inn) (www.postranchinn.com) at 2 p.m. you can tour some of the unique rooms, spa and swimming pool before lunch. The rooms are very expensive but well worth it, I am sure, as everything fits into the landscape and is environmentally friendly. Sierra Mar sits high on a hill with a panoramic view of the ocean and is particularly nice during the day. My lunch of grilled prawns with broad beans, roast root vegetables and French bread with homemade hummus was awesome. The vanilla crème brulee and homemade chocolate chip cookies were a nice finish. Afterwards I checked into Deetjens Big Sur Inn (www.deetjens.com) just a mile or two south, where I would be staying two nights. It is a charming historical inn with adorable rooms with latches. A light dinner at Big Sur Bakery (www.bigsurbakery.com) up the hill of toasted barley with roast squash/celery root and spinach and a cinnamon crème brulee as I leisurely read my book “the fall” by Simon Mawer was a nice ending to my day. a couple passes. A steep but leisurely walk down to the cove takes about 15 minutes and it is a spectacular view of the ocean. Next stop a visit to the waterfalls in the Julia Pfeiffer Burns State Park nearby. Returning north I stopped at Coast Gallery which displays local art and even has a little café. Finally a nice one hour hike into the Andrew Molera State Park. Because of all the rain some of the trails were closed. As it was getting close to 2 p.m. and lunch time I headed to Carmel Valley Road to find the Café Rustica (www.caferusticacarmel.com) where I had a fresh vegetable salad with peanuts, raisins, roast eggplant, carrots and blue cheese with optional fresh baby spinach instead of romaine and a warm chocolate cake with caramel sauce for dessert. Nearby is a public library which is a great place to use the internet as cell phones don’t work too well in the Big Sur area. After checking my e-mail, I drove back to Carmel for another quick look around and found a great shop selling quartz singing bowls which are used for their sound as well as their healing vibrations. The owner was very forthcoming on their history and the next thing I knew I was in the Pilgrim Bookstore nearby listening to Karma Moffett’s “ocean bowls” CD! Back to Deetjen’s for a quick shower and then up to Sierra Mar for dinner. The dining experience is different at night as you can’t see the ocean but most of the tables face the glass windows overlooking the ocean. The food is always very innovative; although quite a bit more expensive than lunch. I had a baby beet salad with pistachios and feta cheese, a risotto with lamb and mushrooms and a mini chocolate devil’s food cake with Clementine sorbet. Sierra Mar has a very peaceful atmosphere which is pleasant to linger in. Sometimes there is someone outside on the balcony with a large telescope through which you can see the planets if the weather is clear. Last time I was there I say Saturn surrounded by its rings as clear as ever. The next morning after a walk along the ocean and another delicious yogurt parfait for breakfast, I headed home, only stopping at La Super-rica Taqueria in Santa Barbara for a No. 8 (chicken with peppers, onions, mushrooms and 3 tortillas) and a No. 20 (gordita filled with spicy refried beans). There is always a line but the place is casual and the food is good so it doesn’t really matter. 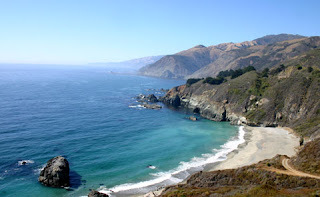 I am already planning my next trip back up to Big Sur!